This entry was posted on 12th July 2018 by Chris Harle. 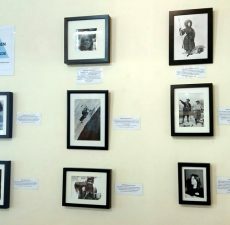 Recently I was asked, “Why are there no female climbers featured in the café photographs?” It was a valid question from a customer who was concerned that women were being under-represented, if at all. Although a reasonable justification could be offered, I could not argue with the facts. Therefore, Outside is grateful to Becky Bull for drawing our attention to this naive omission. We hope that she and others will be happy to see the new display, ‘Women with Altitude’. While female climbers were historically fewer in number and did not always attract the attention of their male contemporaries, they were present across every climbing era. Some may not be household names, but all deserve recognition for their spirit and skill whether as rock climbers, alpinists or authors. An English mountaineer who climbed extensively in the Dolomites. Best known for the first ascent of the south face of the Marmolada in 1901. The 2500’ climb on the biggest face of the highest Dolomite peak was her inspiration. She completed this with her guides Michele Bettega and Bartolo Zagonel. At the age of 24, Beverly Johnson was an established member of the Camp-4 community in Yosemite. She was part of the first all-female ascent of El Capitan and the first woman to solo Dihedral Wall in 1978. However Johnson's talents extended beyond climbing. Other accolades include skiing across Greenland, windsurfing across the Bering Straits and being the first person to cross the Straits of Magellan solo in an open kayak. As well as the first person to pilot an autogyro in Antarctica. Junko Tabei was a Japanese mountaineer who founded the Ladies Climbing Club: Japan (LCC) in 1969. The club's slogan was "Let's go on an overseas expedition by ourselves", and was the first of its kind in Japan. She was the first woman to reach the summit of Mount Everest. As well as the first woman to summit all Seven of the highest peaks on every continent. An English-born Australian archaeologist, mountaineer, and author, Josephine Flood led the Women’s Kulu Expedition in 1961. The following year Flood joined the Women’s Jagdula Expedition to Lha Shamma in Nepal. Her book Four Miles High tells the story of these two expeditions and overland drive to India to reach them. In 1961 she was the first woman to lead Cenotaph Corner. Wanda Rutkiewicz was a Polish mountain climber and the first woman to successfully summit K2, achieved without supplemental oxygen. Her goal was to become the first woman to summit all fourteen of the 8000m peaks. Wanda got over half way to realising the dream, climbing eight before sadly dying on Kangchenjunga. We do not know if she ever reached the summit. For most climbers, Lynn Hill needs little introduction. Widely regarded as one of the world’s leading sport climbers from 1986 to 1992, she has won over thirty international titles. Hill is famous for making the first free ascent of The Nose on El Capitan, Yosemite in 1993, and for repeating it the following year in less than 24 hours. She has been described as one of the best female climbers in the world and one of the best climbers of all time. Elizabeth Coxhead wrote the classic novel, One Green Bottle, now seen as one of the best British mountain-climbing novels ever published. It centres on 18-year-old Cathy Canning, a working-class girl from Birkenhead who escapes into climbing in North Wales. Coxhead herself was a proficient climber. According to local historians, Elizabeth's motto for climbing stated, "A sport is advanced by the handful of people who do it brilliantly, but it is kept sweet and sane by the great numbers of the mediocre, who do it for fun". Henriette d'Angeville was a descendant of a French aristocratic family. Following her grandfather’s execution and father’s imprisonment in the French Revolution, the family moved to the mountains, where she became an enthusiastic walker. In 1838 d'Angeville became the second woman to climb Mont Blanc (Maria Paradis was the 1st in 1808). Her book, My Ascent of Mont Blanc, tells the story of her summit. It was not translated into English until 1992. We sourced the photographs for the Women with Altitude display from the Ken Wilson archives. Most of these are black & white images taken during the 1960s and 1970s at the time he was editor of the influential magazine Mountain. He was particularly good at producing detailed crag shots, fine portraits and being in the right place at the right time e.g. first ascents at Gogarth including the likes of Joe Brown and Peter Crew. The Wilson Archive also contains an excellent collection of slides and prints sent in by climbers from all around the world. Many were included in Mountain or in books published by Wilson under the banner of Diadem or Bâton Wicks. The Outside Café also exhibits artwork and photography by Phil Gibson, Tim Hulley, Stuart Johnson, Katherine Rhodes and Sarah Tasker. You can purchase their work through the shop.